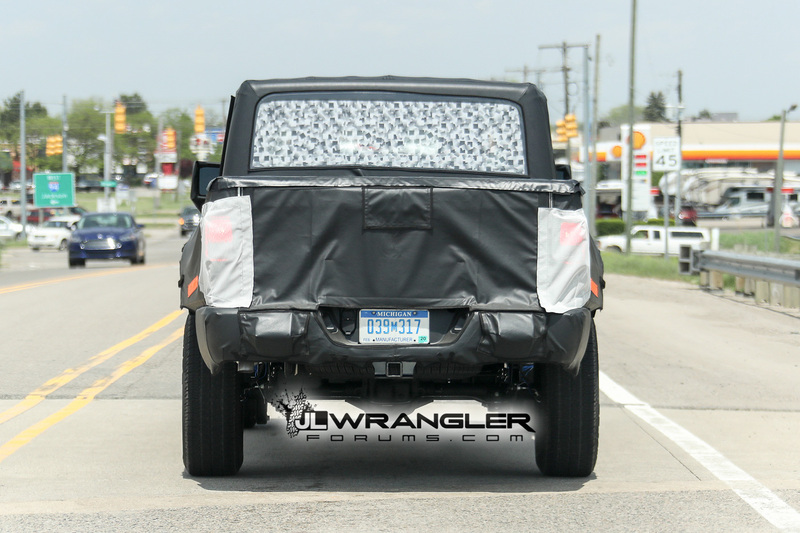 Recently our friends at the JL Wrangler forum have spotted the highly anticipated JT Wrangler Pickup on the road during a test drive. 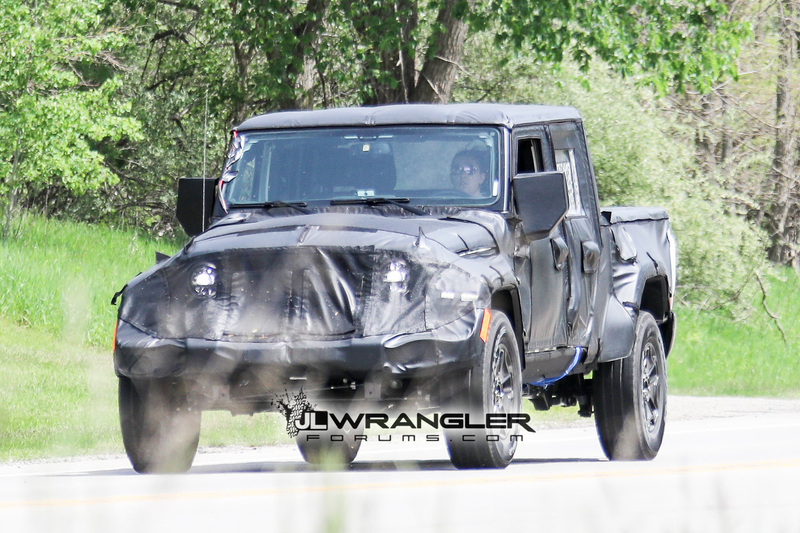 The spy photos confirm past rumors, clarify previously unanswered questions and give us a clearer look of what the proposed JT pickup might end up looking like when it hits the showroom in the fall of 2018 after the release of the 2018 JL Wrangler. Here’s a breakdown of some key elements seen in the photos. 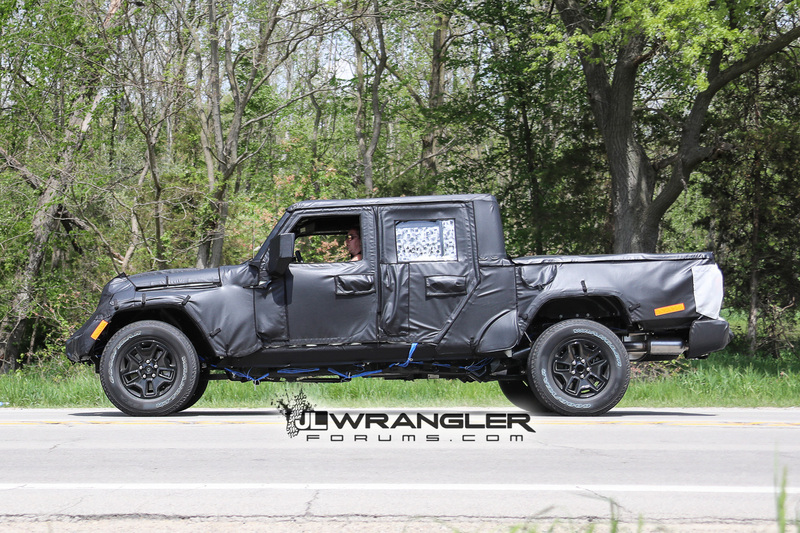 Earlier spy photos of the JT Wrangler pickup had the prototype utilizing a repurposed dodge truck bed. This was clear due to the misalignment of the bed in comparison to the body and wheels. Recently, aerial photos showed a more proportionally sized truck bed, with a cleaner and tighter fit. These recent close up photos give us better view of the truck bed and the overall fitment. One of the things that is noticeably clear is the overall length, the truck bed on the test JT four door Wrangler is much longer with more of an over hang past the rear wheels. This certainly stretches out the Jeep’s wheelbase and calls into question its maneuverability on tight trails. In addition, a longer platform could be problematic on inclined hills with a sharp break-over angle, creating the possibility of getting stuck high center. The longer bed however will allow for more cargo room, making the JT wrangler a legitimate work truck. Earlier concerns and questions when discussing the JT pick up revolved around the position of the spare tire. Traditionally Wranglers have the spare tire mounted on the tailgate, which is attached to hinges that swings open to the side. This wasn’t a practical use for a pick up, which normally utilize a tailgates that fold down flat, for easier access to the truck bed. The spy photos however reveal that the spare tire is mounted under the truck bed, like most other traditional pickups. Although this does solve the issue with the use of the tailgate, it raises a concern in regards to the larger tires. A common modification for most Wrangler owners are larger tires, will this new spare tire space allow for larger tires? That’s something we’ll have to wait and see. These new spy photos of the JT Wrangler also show a consistent look when compared to the front half of the JL Wrangler. A raked grill and windshield, along with a flat hood and defined centerline are clear through the camouflage. In addition, angular bulges along the front fenders seem to indicate a side vent like on the JL Wrangler. Is this JT Wrangler Pickup Truck on the right path? Comment your thoughts below! WoW! Thanks for the awesome opportunity to win not just one, but two jeeps! I’ve always wanted one but have never had the chance.